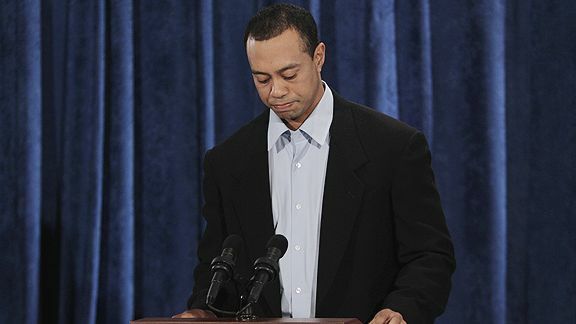 AP Photo/Eric Gay Tiger Woods closed off his body language but seemed sincere, according to expert Tonya Reiman. Tonya Reiman, author of "The Power of Body Language: How to Succeed in Every Business and Social Encounter" and a regular consultant on "The O'Reilly Factor" on Fox News Channel, agreed to watch Tiger Woods' public statement Friday and then discuss what she observed in his body language with Page 2. In general, Reiman said she found Woods to be sincere and genuinely remorseful, although some of his words and actions came off as contrived. Page 2: What's your initial reaction? Tonya Reiman: I think he did very good, especially in the beginning. You'll find if you watch it again that there's times when he speaks very slowly and then he speeds up and then he slows down again. Typically when someone speaks slowly it's because they are really feeling emotional about an issue. So in the beginning he has a very serious affectation. He comes out and he's got a very serious walk, that kind of tabloid walk with his arms extended out a little bit. He looks good. He's nervous, but yet he made terrific eye contact with the people in the audience. You knew that he was definitely feeling anxiety. There were tons of hard swallows. His speech was slow, which I think was a good thing for him, because it makes him look like he was really emotive. Tight-mouthed when he was talking about his wife and children. And I think he also scored points for looking into the camera as if he were talking to TV land. He's really trying to speak to everyone, not just the people in that room. Were there any nonverbal cues that stood out for you as negatives that didn't necessarily jibe with what he was saying? Yeah, actually one of the big things, right off the bat, was when he started pointing his finger, saying "They did not do these things." He was talking about his wife and kids, about how [people] are staking out where his child goes to school. And he tries to then become emphatic and he points his finger and says, "These are things that they did not do." And that was definitely contrived. That wasn't natural. The times that he did pause and look into the camera, did some of that come off as a little insincere? Any time you're reading a speech it's going to come off as insincere. When you have to reference your notes, it's going to come off as slightly insincere. The reason I think he did better than he might have in a regular setting is because when he talked about his wife, kids, mom -- and even when he talked about the people in that room -- he really made sure that he spoke slowly and that he came across as genuine. When he started talking about "Thirteen years ago when I started [the Tiger Woods Foundation]," when he starts talking about the fans and the kids, you can see his speech speeds up, because it's easier for him to talk about that. So when he's talking about his wife and kids and he's trying to make up for what he's done, his voice is really slow, because he's feeling that. This is really tough for him. When he's talking about his foundation and the things that it's done in the past, he speeds up, because these are things that are easier for him to discuss. Oh, that was terrible, because from that point forward you really can't tell much. As far as I'm concerned, the nonverbals ended halfway through because now all you're seeing is not even a full profile. You can't see what the eyes are looking at. When he's looking at the camera, it's great for the audience. You want to be able to judge how often he's looking at the camera versus how many times he's looking at the people in the room, so from that point forward, it becomes a little tougher to determine sincerity or how genuine he was. Did you have to be particularly knowledgeable about the backstory to gauge if he was sincere? I don't think you necessarily need to know the backstory of anyone's apology. What you need to see is whether they hit home with you. He was neutral to emotive. It wasn't like he came out like Kobe Bryant and made this big emotional display. What he did do to carry this off was come off as serious and really trying to make amends for what he had done. When you're looking for falseness or insincerity, you're looking for specific cues, some of which might be constantly shrugging his shoulders or a very high blink rate or constantly licking his lips. Things that will say "Why is he going away from the norm?" He didn't close off his body language. He didn't do a lot of things that one might expect from someone who's falsifying their apology. Having said that, he wasn't as emotive as I expected him to be. Not that I expected him to cry, but maybe be more emotive. Move a little bit. That's called body language lockdown. He barely moved his body, but that could also be context-dependent: He's in this room filled with people he owes an obligation or a response to, so his body language is going to tense up. Reporters weren't allowed to ask questions. But as a body-language expert, if you'd been allowed to ask one question of him during the public statement, what would it have been? people want to understand what drove him to this point. His generic, blanket answer was "You know, I thought it was owed to me. I deserved that." Once he started going in that direction, you start to wonder if he's really being sincere. So I would have asked him that right then, point-blank. And I would have wanted a specific answer. And I'd want to be able to see his face when he's answering that question. But of course, that's something he will not answer. Did he seem coached to you? And can you tell either way? That's a tough question, because any time someone seems sincere, the question comes up, "Well, could he have been coached?" And I'll say, "Yes, he could have been coached." Any of us can be coached to come across better. Because he did speak incredibly slow. I did a show this morning and they asked, "What should he do to appear sincere?" And that was one of the things I said. He needs to speak slowly and make eye contact on specific points. And he did those things. So could he have been coached? Absolutely. But if he was coached, he did his job. He did what he was supposed to do.